Time for a bit of classic old-school action today, with Treasure's Gunstar Heroes. I don't know why I've never played this before... I owned a fair few Megadrive games back in the day, and Gunstar Heroes seems to fit perfectly with the type of game I was buying. I just mustn't have got around to it, I suppose. Shame. Gunstar Heroes is, as you've now come to expect from Treasure, a very well thought-out and designed game. It's got some great features for the time - you get a choice of control method, a choice of starting weapon and a choice of starting level. Each level is wildly different from any of the others, which means you've got a lot of variety right from the off. This is welcome, otherwise this might have veered towards a standard blaster. That said, it's got so much to do and so many tricks up its sleeve that I don't think there would ever be any danger of that. The first level you can choose sees you running and blasting madly right from the off, with enemies swarming at you from all directions. Luckily you've got some neat moves at hand - you can grab the platforms or scenery and either swing up to the platform above, or move along the underside of the platforms, like you would on a set of monkey bars. 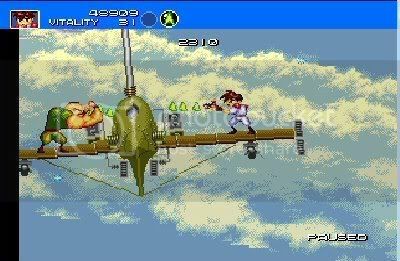 Other levels have you in the Gunstar Heroes equivalent of minecarts, hurtling along at ridiculous speeds and blasting in all directions, or jumping up a series of platforms to get to the top of an aircraft that's taking off, just as examples. It's manic platform shooting, with some great characters and funny touches. Oh, and there are all kinds of mad bosses to tussle with, too. When it comes to shooting stuff, not many people allow you to do it in a finer way than Treasure. And while this isn't as traditional a shooter as, say, Gradius V or Ikaruga, it still gives you hours of top-class blasting action, guaranteed to give you gamer's claw.